This offer has expired and is no longer available . Do you want to get your free trading bot for Huobi ? With the release of Gunbot 11, our partners at Huobi market have been integrated into the latest Gunbot v11 release . Send us your Huobi UID (user id / mail) + your Gunbot order no (or Gunbot license) and we will send you a 100% discount coupon for a standard Gunbot license for Huobi – valued now at 0.1 BTC ! Please remember to specify if it is a fresh Huobi account registered with the above link, or a older Huobi account. 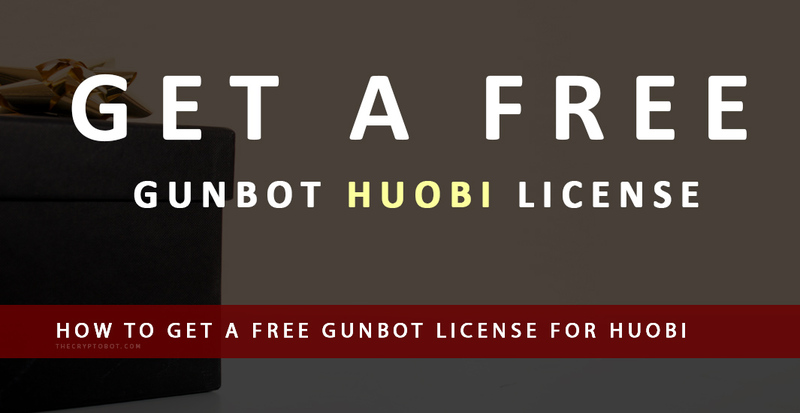 * Free Huobi Gunbot licenses are granted only to Gunbot owners (Standard / Pro / Unlimited). * Non Gunbot customers and Gunbot Lite owners can still request a 50% discount using the same steps as above. What if I already have a Huobi account ? What if I don’t have either a Gunbot License or a Huobi account ? answer : New Gunbot Pro and Gunbot Unlimited licenses get Huobi for free (with the above link registration) . Also, new Standard Gunbot license customers can request a 50% discount coupon for Huobi – limited time only ! How do you get your Huobi UID ? With the latest Gunbot ver 11, Huobi has become part of the Gunbot supported exchanges. Huobi is one of the first in a series of markets that will support the Gunbot Community . To celebrate this new Huobi integration, Gunbot owners can get a free Huobi Gunbot license (new customers can get a 50% discount) with the condition of registering for a Huobi account as a Gunbot Community referred user . The outcome is a win-win situation, both for the Gunbot users that get a free Huobi Gunbot License, and also for the future of Gunbot development.